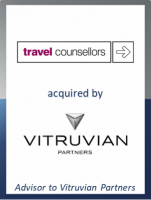 GCA Altium acted as exclusive financial advisor to Vitruvian Partners on its secondary buy-out of the global independent travel company Travel Counsellors, from Equistone Partners Europe. Its franchisee model is underpinned by the company’s proprietary technology platform, Phenix, which assists each Travel Counsellor to run their business and deliver high levels of personal service to both its leisure and business customers. Vitruvian Partners will continue to invest in and build on Travel Counsellors’ success bringing its wide sector and technology experience together with the company’s differentiated business model and culture. It has previously backed travel businesses Skyscanner, JacTravel and OAG, as well as a number of technology-enabled marketplaces including listed technology company Just Eat.